Gabions and MacMat geomats used in government-financed maxi-plan for roads improvement. On 1st December 2014, the UK government announced an ambitious £15 billion plan to increase the capacity and condition of England’s roads, launched by Transport Secretary Patrick McLoughlin and Chief Secretary to the Treasury Danny Alexander. Yorkshire and North East of England were scheduled to benefit from 18 new schemes worth around £2.3 billion, creating an estimated 1,500 construction jobs. The Coal House to Metro centre stretch of the A1 was built 40 years ago and is considered to be one of the most congested in the Highways Agency’s network. It is being upgraded by creating new parallel link roads between the Lobley Hill and the Gateshead Quay (A184) junctions, increasing the lane capacity on the A1 from 2 to 3 lanes in each direction and reconfiguring existing merge and diverge arrangements. 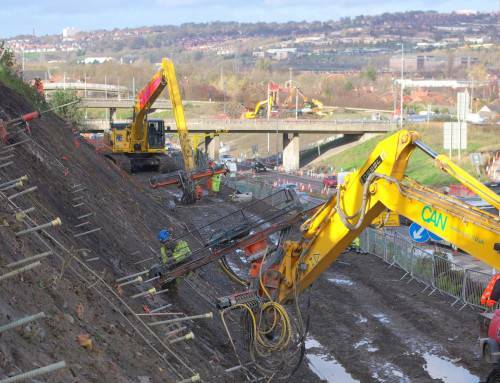 Balfour Beatty, on behalf of the Highways Agency, is carrying out the improvement works and Maccaferri UK is undertaking the construction of the 12 mass gravity gabion retaining walls. The gabion walling is likely to reach circa 4000m3 with over 7,000 tonnes of locally sourced gabion stone being used. All Maccaferri gabion walls are between junctions 67-68. In addition to the 12 gabion walls there are also a number of sheet piled walls and a number of slopes being soil nailed. The soil nailing is being installed in conjunction with Maccaferri MacMat R which have now being covered with shotcrete, a spray-on concrete which uses MacMat R as a binder. Once completed, the road will provide 3.98 miles of continuous 3-lane carriageway and is expected to be fully open to traffic by Spring 2016.